The gravitational-wave detection last year of a neutron star merger has revealed details on neutron star structure, ruling out exotic quark matter in the objects’ cores. A pair of independent studies gives new constraints on the size of neutron stars, suggesting that they are no more than 14 kilometers (8.6 miles) in radius. That’s about twice the length of the Las Vegas strip. This size limit is slightly larger than previous estimates, suggesting that neutron stars might be less exotic than previously thought. Neutron stars are the dense stellar remnants of supernova explosions. Within a tiny radius, they contain a mass of about 1.4 times that of the sun. The extreme densities and pressures smush electrons into the atomic nuclei their orbit — protons and electrons combine into neutrons, so that neutron stars are made mostly of neutrons. But there’s a possibility that the density at their cores might become so high, it breaks matter down into even smaller particles, such as quarks. 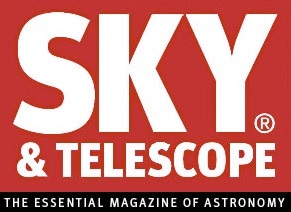 As astrophysicist Feryal Özel (University of Arizona) explained in the July 2017 issue of Sky & Telescope, for neutron stars size really does matter — the smaller the star, the higher its core density. Previous measurements have pointed to a maximum neutron star radius between 10 and 11 km. That may not sound very different from 14 km, but it would be enough to raise the central density by more than a factor of two. “This is enough to have a profound effect on the amount of repulsion the particles experience,” Özel wrote, which would introduce the possibility of a quark-filled core. The new neutron star sizes, published in two papers appearing in April 25th Physical Review Letters, are based on the August 17, 2017, LIGO/Virgo detection of gravitational waves from a pair of neutron stars merging 130 million light-years away. Given their extremely high density, astronomers aren’t certain what neutron stars look like on the inside. Some of their ideas are based on nuclear physics, while the concept of quark matter in particular is based on the physics of high-energy particles. The various approaches can give different predictions about neutron stars’ internal structure. Experiments at the Large Hadron Collider (LHC) at CERN and the Relativistic Heavy Ion Collider at Brookhaven National Laboratory give a sense of what a neutron star might look like in its core. Researchers at these institutions smash lead ions together at close to the speed of light to produce the high temperatures that break down protons and neutrons into a quark-gluon plasma. “While our current theories provide a very good description of dense matter at nuclear densities, their predictions significantly deviate when extrapolated to super-nuclear densities,” adds Fattoyev (Indiana University). Indeed, some of LIGO’s observations aren’t matching up with what scientists previously theorized, specifically with regards to the types of matter found inside of neutron stars, Kurkela says. This artist’s conception portrays two neutron stars at the moment of collision. Dana Berry / SkyWorks Digital, Inc.
As two neutron stars circle each other, their respective gravitational fields create tidal forces in their partner: Gravity pulls more strongly on the side of the star closer to its companion compared to its far side. As a result, both neutron stars stretch, tidally deforming into a shape resembling a rugby ball, Kurkela explains. The neutron stars’ shapes show what they are made of. If the matter inside of neutron stars were soft, that is, containing quarks in addition to neutrons, LIGO would see the neutron stars deform. But LIGO’s observations don’t fit those theories Instead, Kurkela explains, LIGO’s work showed that the neutron stars were like hard, unsquishable balls, even as they merged into each other, which means they contain only neutrons in their cores. The results allowed investigators to rule out the existence of quarks inside of neutron stars. Scientists will need more gravitational-wave observations to confirm what LIGO saw. Moreover, since neutron star collisions generate light in addition to gravitational waves, scientists hope to get more information on composition through follow-up X-ray observations, such as from the Neutron star Interior Composition Explorer (NICER) perched on the International Space Station.